Discover the mysterious, magnificent octopus! Follow a goggle-eyed octopus as she jets through the shadows, tentacles flying behind her. Finally she finds a well-hidden den in which to lay her eggs, which will dangle from the roof like grapes on a string. In silky verse, Karen Wallace explores the mysterious world of the octopus, while Mike Bostock's flowing illustrations bring that world vividly to life. Back matter includes an afterword, resources for further information, a glossary, and an index. A wonderful tie-in to nature or science units about the sea and its inhabitants. --School Library Journal In a picture-book format, this science book presents information on the giant octopus . . . The bold, bright watercolor illustrations help the odd-looking creature become more accessible to young audiences, making this excellent for reading aloud in a classroom setting. --Booklist Brief text and watercolor paintings describe how a female giant octopus moves, protects herself, and lays her eggs . . . With its striking artwork, it will make an enticing read-aloud for children interested in this fascinating sea creature. Karen Wallace says octopuses have always had a special place in her imagination, from the storybook monsters of folklore to the young octopus she once watched escape from a fish trap, climb down a ladder, and sink back into the safety of the sea. 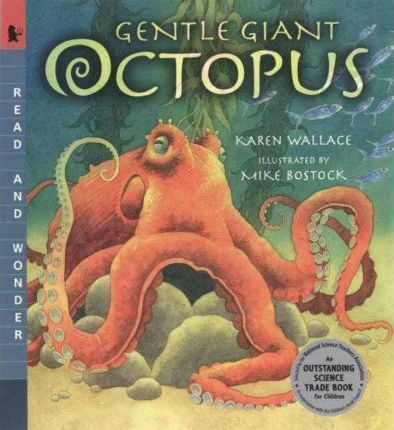 Mike Bostock, while illustrating GENTLE GIANT OCTOPUS, became fascinated by his subjects--the delicate changing color and texture of their skin, the rubbery, rippling way they move, and their transparent soap-bubble-like babies.